The Lotte Giants have gained a reputation as a power-hitting team, and they have the bats to back it up, with names like Lee Dae-ho, Kang Min-ho, Jeon Joon-woo and Choi Jun-seok. But Lotte is not just a one-dimensional team of sluggers; they also have players, like center fielder Na Kyung-min, who are defined not by their power, but by their hustle and scrappy play. Na took a circuitous path to join the Giants. He graduated high school in 2009 and signed with the Chicago Cubs to try and make in Major League Baseball. But after toiling in the minors for several years in the Cubs and San Diego Padres’ organizations, he returned to Korea in 2013 to serve his mandatory military service. He joined the Korean Baseball Organization last season after being signed by Lotte in the third round of the amateur draft, and played 35 games in the 2016 season. He impressed the team in his first season, and this season in an expanded role he has played in 61 games, hitting .277 with a home run and 9 RBIs. In this screencap, Lotte Giants outfielder Na Kyung-min appeals to the third base umpire for a safe call in a game against the Doosan Bears on June 11, 2017. Na has been particularly impressive in Lotte’s last four games. 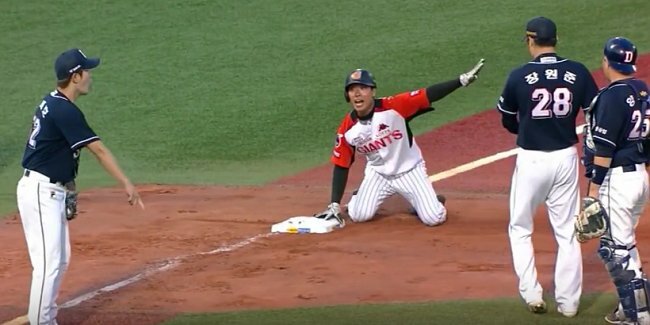 He had three straight multihit games starting July 26, and was the catalyst in Lotte’s comeback victory against the SK Wyverns on Sunday, working a 10-pitch walk against SK closer Park Hee-soo in the ninth inning and coming around to score the tying run. Na has become known to Lotte fans for his hard-nosed hustling playing style. Appearing at the top of the Giants’ lineup, he gets on base and disrupts the timing of opposing pitchers, setting the table for their big bats. He also is a solid defender, and is known for giving his all in the field without regard for his body. Na particularly notes the role of a player like him in the power-hitting Lotte lineup. “On the team, there aren’t many hitters like me. I’m more of a slap hitter though, so it doesn’t help the team if I also try to swing for the fences. My advantage is speed and I’m always thinking of a way to get on base. Na and the Lotte Giants open a three game series against the LG Twins at Jamsil Stadium in Seoul on Tuesday night.